HOPE – The vice president of the Hope School Board was promoted Monday night. Retired college business educator Willie Buck was named president of the Hope School Board here Monday, replacing outgoing president Joe Short, who has retired from board service. 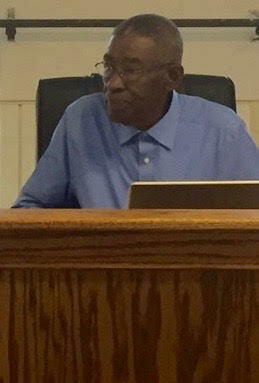 Buck has served on the board from Zone 3 since his original election in September, 2010, and he was most recently vice president of the board. He has been active in acquiring leadership training as a member of the board; and, he most recently represented the board at the Southwest District conference of the National School Boards Association. Buck praised Short’s service tenure, noting that he had “big shoes to fill,” but, he promised to be diligent as board president. “I will work hard and try to make myself more present in the schools,” he said. The board also welcomed new member, Zone 4 trustee Jimmy Courtney, Monday night. Courtney is a lieutenant in the criminal investigative division of the Hope Police Department. Trustee Jesus Coronado, from Zone 7, was elected as vice president of the board. A lieutenant in the criminal investigations division of the Hope Police Department, Coronado was originally elected to the board in 2009. He previously served as board secretary. Retired educator Mildred Green, representing Zone 2, was elected as board secretary. Green has served as a board member since first elected in September, 2010. Zone 6 Trustee Denny Dickinson returned to board service Monday night after winning re-election. A rancher and businessman in Hope and the Guernsey area, Dickinson’s 14-year board tenure is the third-longest, having begun after his original election in September, 2002. The board was given some good news straightaway by Superintendent Bobby Hart, who reported on a district presentation to the state education department in Little Rock. The quip emphasized the enormity of the work by Hoglund and the HHS faculty and staff in turning a corner in the culture and academic quality at HHS, he said. “We have to understand the situations where our students come from,” Hoglund said. He said that Narlesky had aided that improvement with data-driven tools that allowed both Hoglund and his faculty to better develop student growth. “I’m learning to be more data-driven,” he added. Hoglund said that he is attempting to have parents and other stakeholders realize the importance of the collaborative contribution they can make in student growth. Narlesky emphasized how that approach is being applied across all five HPSD campuses. She said the plan submitted to the state last week concerning the academic growth at HHS and Beryl Henry Elementary School is indicative of the effectiveness of the approach to focus upon school culture and the drivers of academic growth. “My work includes making sure we complete every piece of the program the state wants us to complete,” Narlesky said. Those efforts have been augmented by the services of the Arkansas Leadership Academy, a consultant in the field of organizational leadership in education. Jerry Vaughn, performance coach for ALA, has worked with the district this year to address three key elements, Vaughn told the board. Those elements include an understanding of the culture of each campus in the district; an understanding of needs relative to the skills present to address them; and, the development of collaboration, peer learning and student voice structures on each campus. “That allows you to use the learning in your district to give the community a sense of hope that you’re making progress,” Vaughn said. Vaughn said he has been impressed with the attitude of campus administrators in Hope. “They have a heart for the students,” he said. The board also learned Monday night that the $4 million expansion project at Beryl Henry Elementary School is generally on schedule. Assistant Superintendent for Facilities and Transportation Steve Bradshaw told the board the “safe room” structure being installed on the campus has been raised and is ready for interior and exterior finish work. The pre-fabricated concrete facility is composed of 40,000-pound structural panels that are welded together to form the shell of the 5,168 square-foot building. Bradshaw said the building will serve as a multipurpose and physical education activities space for the campus, but it will also be available as a community “safe room” in dangerous weather. “The building will look a little different that it does now when it is finished,” Bradshaw said. He said electrical “rough-in” will be the next phase of the work in the building. The overall project will include new special services classroom space, an art room, computer room, music room, library and three classrooms in another 9,800-plus square-feet, Bradshaw said. Remodeled interior space in the current main building is now being used for administrative and counseling office space. A portico entrance on the north side of the main building also now marks the main entrance to the campus. --Adopted a hazard mitigation plan resolution for the district. --Adopted an equity compliance report for the district. --Adopted a minority teacher recruitment report for the district. --Approved facilities use of the Yerger Middle School gymnasium for an Oct. 29 basketball tournament. --Approved three personnel actions including, resignation of second grade teacher Patsy Vaughn, hiring of second grade teacher Mary Mason, and designation of BHE Counselor Christi Sullivan as yearbook sponsor for the BHE campus.